The first step in funeral planning, particularly if you find yourself at-need, is to get a friend by your side. This should be someone who is somewhat removed from the deceased, so the friend’s emotions will not be a factor. It should also be someone whose judgement you trust and, preferably, someone who has been through the arrangement process in the recent past. This friend should be someone who has the strength of character to say ‘NO’ or at least ‘Not YET’, to keep you from being pressured into hasty decisions. We would have little respect for anyone who walked onto a used car lot and said to the salesman, “Just give me what you think I need, and make it nice.”, and yet this is precisely what many families do at the funeral home. One of our researchers, working undercover so to speak, hired into a funeral home and underwent training as a Grief Counselor, which is a death care industry euphemism for SALESMAN. This training consisted of one day, with heavy emphasis on getting the family to say those magic words YOU do it. The grief portion of the training consisted of learning how to speak in hushed tones, when to push a box of tissues across the desk and little else. The funeral directors have positioned themselves in a unique niche, somewhere between the clergy — notice how their sales offices look like the inside of a church, complete with soft music, religious icons and crucifixes? — and the medical profession. Some even refer to the dead as their patients, though by our humble estimation by the time a body arrives at a funeral home the patient status has passed. Truth is, there are states where NO formal training is required to be a funeral director. The vast majority of states require a year or less of class work beyond high school, typicially with an equal period spent as an apprentice. Many of these vocational school graduates, however, expect to be paid on a par with a physician, hence the exorbitant prices and stilted terminology. In fairness I must mention that some states require a Bachelor’s degree in Mortuary Science plus an internship and passing a state exam to become a funeral director. Also it should be mentioned that those making the most from the Death Care business are the funeral home OWNERS, not necessarily their employees. Just as is the case with pharmacies, licensed funeral directors often find themselves in a situation where their salraries remain stagnant for years. This is particularly true in the case of Corporate-Owned funeral homes, crematories, and cemeteries. More about these later. The purpose of the church-like atmosphere is to instill a feeling of trust. Speaking in hushed voices, practiced sad looks, and well-calculated words of condolence lead up to the inevitable “I know you’d only want the best for your loved one.”, which means literally — “This is gonna cost you dearly!” Knowing to expect this can go a long way toward getting the goods and services you want without going overboard. 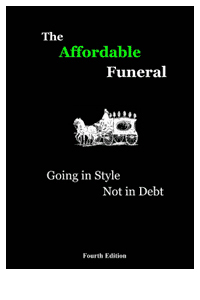 In a survey of several thousand funeral directors, in response to the question Why would you say funerals cost so much?, over 85% replied “Emotional overspending by the family.” As you’ll see later, much is done to heighten emotions, to insure this very thing will happen. Your friend is your safeguard against this. Knowing to say ‘NO’ or even ‘NOT YET’ will give you time to let the emotions pass and make your decisions after careful thought. Take a moment here to mentally make yourself a short list of who this person could be. I’d recommend not using clergy, since many of them enjoy close relationships with the funeral directors. Next time you’re in church, look around and you’ll likely see hymnals or hymnal covers, fans, the daily pamphlet of services agenda, or other items bearing the name of one funeral home or another. Ministers are their best source of referral business after medical staff at the hospitals and nursing homes, and they go to great lengths to endear themselves to clergy. Pick your friend and brief him or her that you want them to make sure you don’t make any contractual obligations during the initial visit. Go back home or to a coffee shop nearby and talk it over. If need be, you can say you want to run your decisions by other family members first, but getting outside that controlled environment and into the light of day is key to making rational decisions. NOTE: How much you cared for the deceased is in no way reflected by how much you spend, and never allow yourself to be told otherwise.